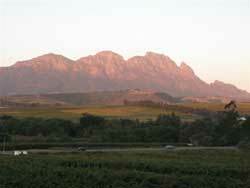 A picture of Simonsberg taken from the stoep of Beyerskloof showing the autumn leaves in the vineyards. I did the fatal thing - I delayed this newsletter for so long that I now have too much to tell you. The Winelands of the Cape is well and alive and I will try and capture the more interesting tidbits. We have had an exciting summer, lots of wind, very little rain, a number of mountain fires, but a good vintage was bestowed upon us. The first 2011 vintage wine, for information for our northern hemisphere readers, is already on the market and extremely drinkable, the Van Loveren Sauvignon Blanc. In fact, I was there during the harvesting, and ate some of the SB grapes, then I tasted the fermenting juice, or 'mos' as we call it, and now I have also had the wine to drink. And on the tourism front it has been going well too, with a number of folks who gave me the pleasure of accompanying them through the Winelands during harvesting. South Africa is still basking in the glory of the World Cup which took place nearly a full year ago, we can still hear the vuvuzellas. And now the guys are returning, this time with their wives, and sometimes bringing their children as well. The tourism authorities say that the figures are up and we can expect a lot of attention once the recession in Europe softens out. At the time of writing the local elections were but a few days away. I have never seen so much excitement for a local election. I often tell my visitors that the dynamics of this country is fascinating and life is never dull. We sometimes get so despondent with decisions the Government makes, but give us half a chance, and we are motivated once again to make the most of it. The ANC of Nelson Mandela has changed completely and it seems as if they are struggling to generate the same support as in the past. But then again, one never knows. We'll see. The autumn colours this year are marvellous. Not only the vines, but also the liquidambers and the pin oaks are giving us a wonderful display. The sparkling winter days are nearly transparent and the mountains under these conditions are extraordinary beautiful. 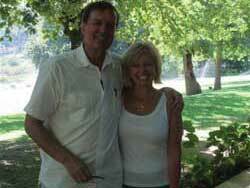 Jane Wylie turned into an actress on French TV whilst visiting the Winelands with me - and an attractive one as well. Husband Brian took the photograph. Katie Fewkes and Mark Ziles of Audley, with my friends and colleagues Bill and Susan Alexander, and myself, after a lovely lunch at the Tokara Olive Shed. Amy Moore and Mat trying the wedding cup at Warwick Esate, not with much success. What you see running from her mouth is not blood but Pinotage! 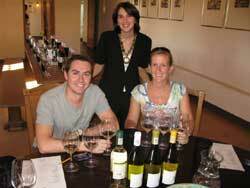 The honeymoon couple Jeremy and Karen Bomford look happy after their Heathrow ordeal, with Melissa du Toit of L'Ormarins, who told them more about the wine of the Estate. The most interesting visit that I had over the past few months was a team from French TV who wanted to know from me why our wine-tourism is so successful when compared to the wine tourism of France. I had an interesting day, and I think they did as well. My main message during the long day was that our people make the difference. Our cellar door staff are generally committed, friendly, jovial, knowledgeable, helpful, and as it happened they excelled on that day. I was very proud. Friends of ours, Brian and Jane Wylie from Toronto, were the guinea pigs who had to act as if they were my clients for the day. What was more interesting about the programme, they could in the end not include the importance of the Huguenots who came to the Cape in 1688, as French TV said that they have had enough programmes on the Huguenots in South Africa. And there I was ready to tell them that I am the 9th generation descendant of Francois, who was a winemaker in the Loire valley. Other visitors were Katie Fewkes and Mark Ziles from Audley Travel in Oxford, whom I took on an educational in the Winelands. Audley has been very good to me since I started guiding some five years ago and their accent on quality and knowledge is admirable. And then through a friend I also received Amy Moore and Matt here. Amy was the producer of a highly successful TV series called "The No1 Ladies Detective Agency" which was filmed in Botswana, but broadcasted everywhere. She and Matt tried to drink from the marriage cup at Warwick Wine Estate, but as you can see, they were not very successful. And then I had the married couple Jeremy and Karen Bomford who got married in the Midlands of England on the Saturday, promply dashed off to Heathrow to depart on their honeymoon, but had a flight delay and sat on the plane for 5 hours, only to be called back to depart 24 hours later. Happy honeymoon at Heathrow! They were marvelous when I picked them up at the airport, and managed to show an interest throughout, except for a few heads nodding in the car now and again. Even now at the beginning of winter the programmes for the rest of the year are being finalised. 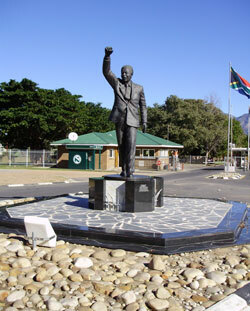 Firstly, a series of festivals await visitors to the Winelands. The now wellknown Wacky Wine Weekend, that drew some 25 000 people to Robertson last year, will take place from 2 to 5 June, the Robertson Slow Market is from 5 to 7 August and the Wine on the River from 14 to 16 October. All three of them worth the while visiting. The Stellenbosch Wine festival, the mother of them all, takes place from 28 to 31 July. It is apparently returning to its original format, having made some changes in order to coincide with the World Cup. Then there are festivals in Durbanville, Riebeeck Valley, and of course also Franschhoek, too many to go into detail. 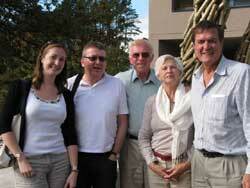 But for anybody planning a visit to the Winelands it is worth your while enquiring about these activities. A good case in point was the Cheese Festival which took place at the end of April. Cheeses from all over South Africa were displayed, but then also some 35 wine stalls were scattered all over the show grounds, with 18 Pinotage stalls together in one corner, offering a wide variety of different terroir pinotages to tasters. What is happening in the vineyards now include typical winter activities. The preparation of the soil for new plantings, and the pruning of the vines, are most important.